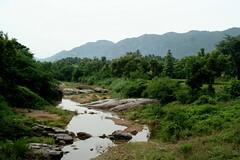 Padavedu is a small village in between Vellore and Tiruvannamalai. Probably the only place where there is a temple in the middle of a banana and paddy field(Will come to it at the end of the log). 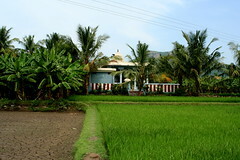 This place is quite famous for the Renuka Parameswari temple. But apart from that not much is known(Atleast for me). 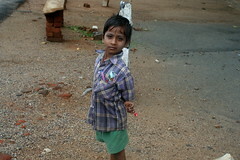 After spending a day at Vellore on saturday I was quite confused on the plans for Sunday. 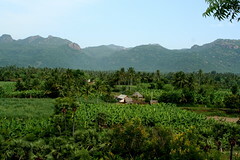 Initially the plan was to visit Virinjipuram and then Mahadeva Malai. Later, I happened to meet one of my project managers from my previous company at Tiruvalam. It was a very pleasant surprise, and it was he who suggested me to visit Melpadi and then Padavedu. He mentioned that there was a very old Ramar temple in Padavedu and it was something not to be missed. Later my brother also mentioned about this place. He said there were around 7 to 8 old temples in Padavedu and they are worth seeing. So I changed my plans and decided to visit Padavedu. Sambuvarayars are from Padavedu. They ruled this place. 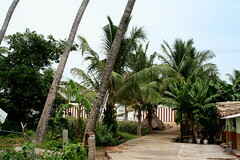 According to history, most of the temples (Except for Venugopala Swamy and Lakshmi Narasimhar) were submerged in sand. 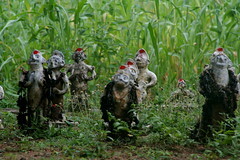 They were discovered in 1993 by TVS family and from then they are maintaining it. It had rained the previous night and the route to Padavedu was quite scenic. 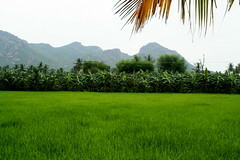 Lush greenery all around made me wonder if I was near Vellore. 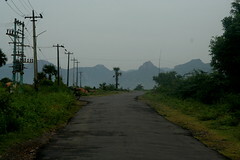 I took the Vellore-Tiurvannamalai route and later took a diversion for Padavedu beyond a village called Kannamangalam. 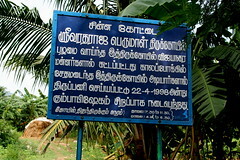 Till Kannamangalam it was a state highway and later a normal road. Even the normal road was quite good. As always with many village roads, you could see few kaaval deivams on the way. I am not sure what these small dolls are. Any idea what they could be? This is the first temple I visited. The Ganesha is around 5.5 feet tall and looks very majestic. There is nothing apart from this statue here. But worth spending few minutes. 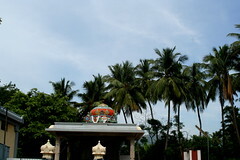 My brother mentioned to me that there is a place called Uppur near Rameswaram, where such Ganesha temple is there. This is a temple where Lord Rama is in the pose of meditation. He is seated in Padmasana. This temple was also buried in sand and was dug out recently. They have renovated the temple really well without disturbing the original architecture. This is a must visit temple for anyone who loves old temples in a peaceful atmosphere. You are not allowed to take photographs within the temple. 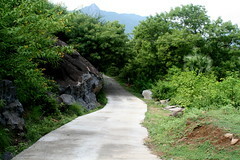 This is on the way to Ramar temple from Renukambal temple. 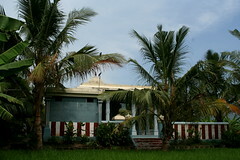 It is close to a Draupadhi Mandapam. This priest does the pooja for Varadaraja perumaL temple too. So if you want to visit Varadaraja Perumal temple, you better visit here first and ask the priest to take you there. There is a 7 to 7.5 ft tall Anjaneyar inside. After visiting Ramar temple, I went to Lakshmi Narasimhar temple. This was one of the temples that was not submerged. From Ramar temple keep going straight, take first right. You will come across a small bridge over a small river. Keep going straight till you see the blue board. 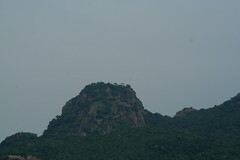 You will get to see another hill immediately, but that is Velmurugan temple where there is a single Vel. I didn’t go there. It is on top a small hill and the view from here is breathtaking! They do Abishekam for Narasimhar on Sundays. This was my favorite. 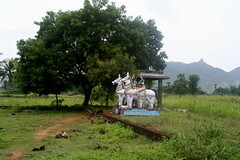 I have never been to a temple which is in the middle of a field. 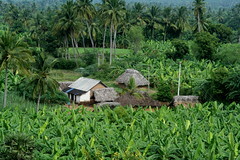 Extremely nice ambience with fields, banana trees and mountains covering it. 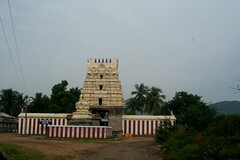 This temple is for Varadaraja perumaL. This is a good place to meditate and spend atleast half an hour forgetting everything else. 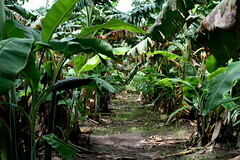 The walk through paddy field and banana trees is an interesting experience too with water trickling down on you. No words can do justice to this place. I would definitely visit this place again! 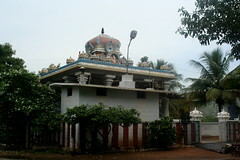 This temple is the oldest of the lot and looks very simple. 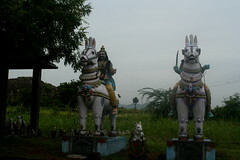 The amman in this temple is Aparnambikai and the statue is around 5.5 to 5.7 feet tall. Right in front of the Amman statue, there will be a pit from where they discovered the statues and ornaments. Ask the priest to show you the place. The priest mentioned that Thirunavukkarasar has sung a song on this temple, but I am not very sure. Nevertheless a must visit place in Padavedu. There are two to three routes for reaching Padavedu. I would suggest you to take the route via vaazhiyur. 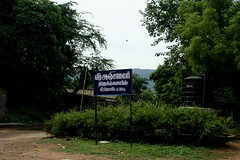 If you proceed for some around 26 kms from Vellore on the Vellore – Tiruvannamalai route you will find this sign board on the left. Take a right turn there and keep proceeding for some 4 or 5 kms. You will have a diversion for Padavedu. You can ask people for directions and they will definitely help. 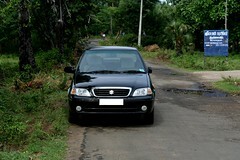 First you will reach Ganesapuram and from then on it is just one road. In case you are coming from Bangalore, after crossing the paLLikoNda toll gate take a right turn. That is some 1 or 1.5 kms after the toll gate. After traveling for around 22 kms in that road, you will reach a junction called Sattamadurai. 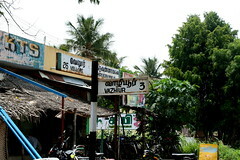 Take a right turn there and travel further for some 10 kms till you reach the vaazhiyur junction. You get to avoid Vellore, and also save some 45 kms. No food is available at Padavedu. As you can see all that is there are just temples and agricultural lands 🙂 But if you call the priest Vasudeva Bhattar in advance he will arrange some temple prasadam(puLiyodharai, curd rice, lemon rice etc) for you 🙂 Mr Vasudeva Bhattar can be reached at +91 98940 34069. 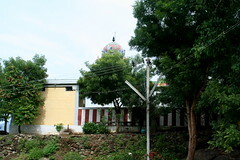 Venugopala Swamy temple on the hill is open only on saturdays. And by morning a tractor and jeep leaves for the hill. Car cannot climb up. I think the tractor leaves at 7 or so in the morning. So plan for this place on a Saturday as you will get to see that temple too. Photography is not allowed inside in any of the temples. All the statues in the temples are extremely old. They date back to 12th century AD and before. Till 1993 all these were buried under the ground, and renovated by TVS group. Special mention needs to be done about the Renukambal trust(Owned by TVS) which maintains these temples in such a clean and beautiful fashion. Please do make it a point to visit this village once. It is just a day trip either from Bangalore or Chennai 🙂 Its worth it. 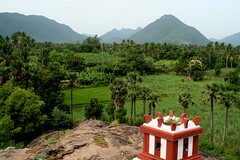 And try to visit some temples which are mentioned in the Renugambal site(Photos are available), that I have not covered. And in case you are visiting, do visit everything and not just a few. This entry was posted in Temple, Travel by F e r r a r i. Bookmark the permalink. I liked this one compared to the other two. Fantastic, Prabhu. Must do this one. I just gotta see when. I think you would have gained some 25% health just by this visit. Did you end up coughing when you re-entered the highway or after reaching Bangalore? and if i post 2 comments on 2 different posts, bloody wordpress is asking me to slow down! 2 much! Nice one Prabhu. I have this Q. we find these many grand temples in our south India built by Kings, but very few aranmanais. why so? Very nice place to must visit! 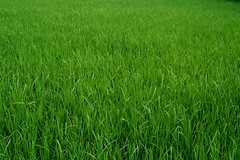 pics are very green, good writeup. the front grill is class.. Thanks a lot for taking us through these temples. Pictures are nice. we knew only very few temples and this reminds that tourism in India / tamil nadu has to be developed a lot when compared to western countries. er..why the sudden temple-visit boom?Asking for some really “big” “lifetime” boon ? i am sure Venu Srinivasan, Chairman of TVS and the managing trustee of SST(srinivasan service trust) wld b happy to note the interest u hv evinced! Ammayappa Eswarar Temple also is said to have some v old inscriptions on its wall…dated the saka yr…did u see that? Very nice work indeed, Prabhu. Details to the micro level. What a sight and soothing effect to the eyes.. I’m sure with the technology and people like you writing about these places, these places will soon be crowded. I love visiting old temples 🙂 No david boon or life time boon. 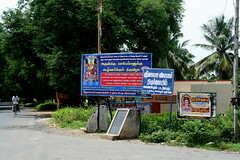 There is another temple in the middle of the field in Kumbakonam -> Mayavaram -> Sirgazhi route. This is a conjecture as an answer to Ba3’s question. 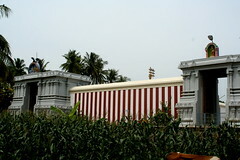 Temples were seen as public properties. Even now so, but, sadly, from a different angle. On the other hand palaces are kings. Rise and fall of glory of the palace rises and falls with likeability of the ruler. So if prinicely guys were ust messing around there is no sense of belonging to people and they really did not or would not care about kings and their abodes. Where as for temples, whoever might have built it for any reason, the public had a sense of belonging. There is this wonderful concept of kuladeivam too. So it makes sense that temples are, rather, were taken care of much better than palaces. After all such huge places could not be maintained by a single family. You need more participation. This is just my guess. Visited these places yesterday after visiting the Sri Puram Temple (Laxmi Temple, made completely of Gold). Unfortunately, i missed the Varadharaja Perumal Temple @ padavedu. Very little known & beautiful place, indeed!!! article which provides details and nice pictures. Your blogs are very, have been tracking them for a long time. I share similar interests. Keep up the good work. I pray to the almighty to give you strength to continue this good work. Have u heard about Kamalaka Kameswarar Devasthanam in the heart of the city. In Triplicane, a must visit. Close to Gosha Hospital. It is estimated that the temple would be around 800 years old. See if you can make on one of those festival days. The next one is Pavithrosavam in the month of Aug.
Sri Vasudeva Bhattacharyar has become a good friend of mine. I have already made 3 trips to Padavedu and has written two travelogues on Padavedu. Everytime I go, I get some new information and the divine keeps inviting me for the next trip. So I don’t know still how many trips more are there. By the way, the main reason for writing this is, Vasudeva Bhattachryar is trying to contact you but could not. You may pls try to contact him asap. I am from Gudiyattam near Vellore. It is a shame i dont’ even know these places.